Modifications: I added an onion and some chopped spinach because we had some and its an easy way to get some greens into a dish. I also used the InstantPot instead of a slow cooker. I sautéed the garlic and onions and then added the rest of the ingredients and did it on manual high pressure for 70 minutes. Kids: All seemed to like it, Annie and Luke after they finally gave it a chance. Scary food! Looks different! Notes: This meal almost seemed kind of fancy, which is funny because if you take out the onion and spinach, its barely any work at all. I think I’d try it next time with short ribs. 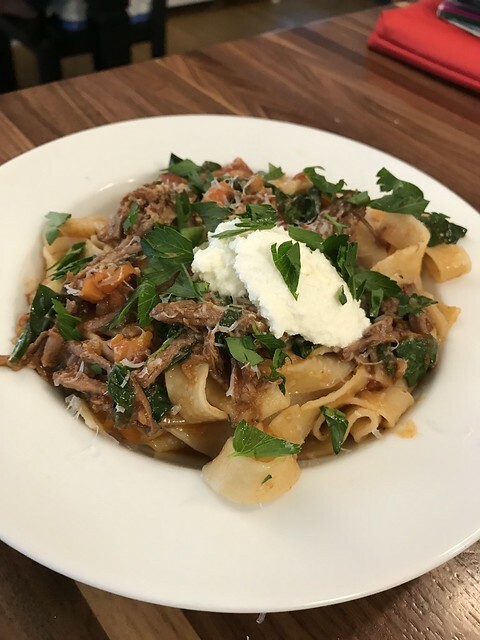 This entry was posted in beef, carrot, cheese, greens, instantpot, one dish meal, onion, parmesan, parsley, pasta, ricotta cheese, spinach, tomatoes. Bookmark the permalink.